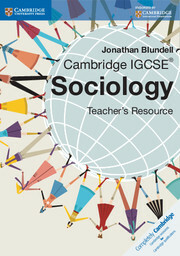 This fresh set of resources for Cambridge IGCSE Sociology syllabus 0495 (and Cambridge O Level Sociology syllabus 2251) is carefully crafted to match and support the revised syllabus for first examination in 2016. 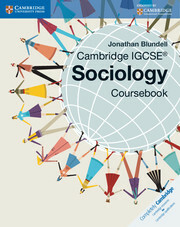 Written in clear and accessible language, Cambridge IGCSE Sociology: Coursebook provides comprehensive coverage of the syllabus in a visually-stimulating format. Key sociological research combined with case studies and thought provoking questions help in understanding concepts.Features such as Key terms and Revision checklists further reinforce learning and understanding of core subject areas. Engaging activities help in applying knowledge in various contexts and building interpretation, analytical and evaluation skills.Cambridge IGCSE Sociology: Coursebook provides complete exam support with each chapter culminating in exam-style questions and a further chapter dedicated to revision, and examination skills and practice. A Teacher's Resource CD-ROM is also available. Introduction contextualises the content covered within each chapter and offers an engaging start. Learning objectives clearly set out the aims. Key terms enhance understanding of the text. Questions within the chapter aid self assessment. Activities are focussed towards building key skills required by the assessment objectives - interpretation, analysis and evaluation. Case studies put sociological theories and research in context. Exemplar examination questions help in familiarising with the style of questions encountered in exams, and assess understanding and skills to handle them.